(San Antonio, Texas - November 3, 2011) - Texas horseman Robert “Pepper” Martin, age 89, passed away Friday, October 28, 2011. 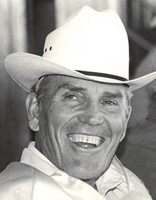 Martin was the father of former Texas Racing Commissioner Michael Martin. Pepper was born July 22, 1922 in Big Spring, TX. Pepper eloped with his high school sweetheart Hope Sisson in 1941. From 1943 to 1945 he served in the South Pacific during WWII. A Minor League baseball player and manager early in life, Pepper made his career in bowling and was instrumental in starting Columbia Bowling Industries. Later in life, Pepper developed a passion for horses and opened Alamo Stud Farm. After the death of his wife in 1995, Pepper remarried Beth Holden in 1997. More than anything Pepper will be remembered as an honorable man who inspired admiration and respect. A friendly, straight shooter, Pepper also had a playful and mischievous streak that kept everyone around him smiling. He will be missed by all. He is survived by his wife, children, grandchildren, and many friends. The family requests that memorial contributions be made in lieu of flowers. A memorial service will be held for Martin on Saturday, November 5, 2011 at 1:00 p.m. at Porter Loring Mortuary North Chapel, 2102 N. Loop 1604 East, San Antonio, TX 78232-5650. If you would like to share your thoughts and memories about Martin or read the online guestbook, click here.